Final results and more pictures here. Despite a good deal of rain early in the month, we've been pretty lucky lately on the Wednesday night rides. This week proved to be the same as the infamous April showers missed us again. Another good amount of riders showed up but the fast group was scaled back to 4 because of a few MIA riders. Bummer for them since we went faster and longer than previous weeks. Less stopping and more riding with a whole lot of hills. It was closing in on 8:30 when we poked out of the woods, riding by feel in the dusk. Saturday the weather forecast is not looking good, rain all day. For once they get it right. 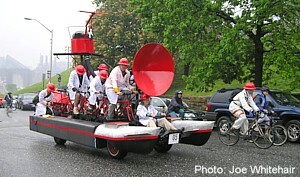 Gloomy, gray and steady rain are in store for the Kinetic Sculpture race. But we know that won't stop the racers so we head out too. Five of us pedal down and two of the ladies rack their bikes on the auto and meet us down there. After a wet but uneventful ride we roll into the staging area and regroup. Almost immediately meet Jim from GeekPunk.org, a fellow SSer and one of the pilots of the dragon seen in last week's post. They haven't had much practice on their sculpture but are ready for anything. Shortly afterwards I connect with Dave and Nils who will be assuming the roles of pilot and barnacle respectively for the incredible engineering feat called the Platypus. They are only a couple of the large crew that will be needed to man this operation. Constructed of 8 bicycles and parts from a Suzuki Samurai plus who knows what else, the Platypus weighs an estimated 1.5 tons and sports a transmission with reverse, a steering wheel and a crows nest. Keep in mind this thing needs to be 100% human powered. 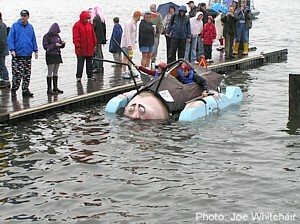 Despite the weather there is a good crowd of spectators and plenty of "racers". With a bang the racers are off Le man's style, fighting the crowd and trying to get these big lumbering pieces of art rolling for the start of a long day that will involve 15 miles of road riding, a water course and a mud/sand pit. 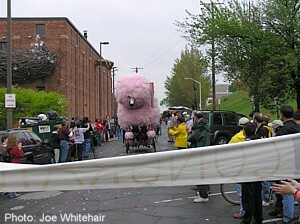 I can only imagine the reactions from the people in traffic that have no idea what is going on and are being held up by the likes of a giant pink poodle and a Kafka cockroach, to name a few. We all saddle up and fall in with the sculptures. The beginning tests both pilots and machines. Almost immediately the steepness of Federal Hill must be conquered and this has put the hurt on many a pilot and machine. For all of it's advanced engineering and testing, the Platypus experiences an issue on this hill. Dave's transmission on his portion of the "engine" fails as his derailluer folds up like a piece of paper, no doubt as a result of his burly legs. But Dave is a single speeder and takes immediate and appropriate action. As the rest of the pilots continue to pedal up hill Dave whips out his tool kit and removes the offending hunk of metal and turns his machine into a single speed, literally on the fly (see pic above). 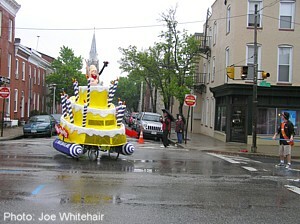 Once the hill is conquered the parade of floats chugs through the neighborhoods of Baltimore with people watching from doorways and curious drivers wondering why the cops are holding them up until they see this spectacle of people and art pass by. Fairly early on we are following the duck float which is surrounded by a lot of kids on bicycles. Kids who wander back and forth without looking where they are going. I give Julie a warning to stay clear of them and next thing I know I see a commotion up ahead and riders down. Two kids on bikes box Paul in and then he gets taken out by the duck. Full contact sculpture racing and we haven't even started drinking yet! We are back on our way and steering clear of the duck after Paul is briefly heckled by the cops. On our way to the water route we pick up Ken who is on the route and then make our way to pick up some liquid refreshment. A quick stop at the liqueur store and we empty the water bottles to replace them with as much beer as we can fit, stash the extras in our bags and swing back out on the route for some more rainy riding. Stocked up with beer we find some rocks to plant our butts on and watch the water section. A couple of sculptures have disasters and a small boy gets taken out by the three car train that barrels down the boat launch ramp. An ambulance is called, but in the end it looks like the train sustained more damage than the kid. We pick up Andy and Bill and this point and our group has swollen to ten. In need of food and more beer we venture over to the Canton square and hope we can grub down before the mud/sand pit adventure begins. Getting out of the rain is good, but once again, for the third year in a row, I miss this section. Better planning next year and perhaps I'll see it. Our pack of riders takes to the streets and dominates lanes like a mini critical mass and we head back to the museum for the finish. Paul has incident #2 as he tries to turn on a wet man-hole and leave some skin on the asphalt. Stoner quickly tries to imitate but I think he survived without shedding any blood. For some reason they have cut out the second water section this year. No word if it's due to the weather, the earlier injury or some other reason. It's late afternoon by this point and I'm sure most of the soggy pilots don't mind. With all sculptures in, our group splinters up to head back and grab some more beers to finish the day. One flat on the way back and that's all she wrote.